Halfway to Heaven is a gay pub offering a large selection of beverages and event-filled late nights. Two tables outside looking towards Trafalgar Square and Charing Cross. What did you think of Halfway to Heaven? It is a nice enough pub, but that's all it is. I recommend it if you want to be outside the hustle and bustle of Old Compton Street queens. Cabaret nights are fun here and the bars don't get crowded like everywhere else, so you can still order your drinks and go upstairs if drag is not your thing. If you're outside and there are free tables, you can enjoy a pint with a view of the National Gallery which is quite impressive. My friend Stephen and I have always loved going to Halfway to Heaven when we are up in London as unfortunately we are unlucky, at this time, not to be living nearer to make our visits more frequent. The manager and his staff are always very polite, sociable and take pride in their job. I would not hesitate to recommend this venue to any of my friends who would enjoy this sociable venue and I rate it as a 5 star. Robbie C-C. 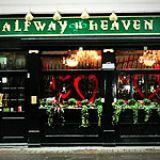 Dedicated to the guilty pleasures of karaoke and cheesy pop music, Halfway to Heaven should only really be enjoyed when you’ve already had a couple of drinks to put you in the mood. Halfway to Heaven is on Duncannon Street next to Trafalgar Square, a very short walk from Charing Cross station. The bustling location is set apart from most of London’s gay nightlife, although you can carry the night on at plenty of other venues nearby. This small pub is easy to find with bright green signage and gothic writing outside, and once inside it never feels too cramped thanks to ample seating and lots of windows. Attracting the full range of hen parties, gay twinks and the odd drag queen, Halfway to Heaven is how gay bars once were. There’s something archaic about karaoke several nights a week, cheap deals on alcopops and Kylie on loop, although the crowd seems to lap it up. The best advice is to arrive well lubricated and in a big group, as that’s sure to guarantee more enjoyment. Certainly impossible to fault are the friendly bar staff, while they might not be whipping up extravagant cocktails or dolling out vintage Champagne, they are fast and efficient with what they do offer and usually accompany it with cheeky banter and a smile. The punters are a sociable crowd, too, probably fuelled by the cheap bar promotions. Resident DJ and karaoke expert Kevin Walsh keeps it cheesy with a camp mix of current chart hits and disco classics. Thursdays and Sundays the surprisingly numerous karaoke contingent take over, too many of whom apparently feel the need to murder ‘Wind Beneath My Wings’ whilst making eyes at someone across the room. You’ll definitely have to leave your attitude at the door to enjoy that, but just try and surround yourself with a big group and the worst bits of the karaoke shouldn’t be too hard to ignore. 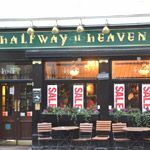 Halfway to Heaven prides itself on offering a wide choice of draught and bottled beers, with prices from around just £3. During the week, there are different promotions on at various times such as buy one get one free or discounted prices, so it’s worth asking first. If you can set aside your attitude, Halfway to Heaven can be a fun, cheap night out for a group of friends, but London gay bars really should be doing something a bit more modern if they want to thrive these days.